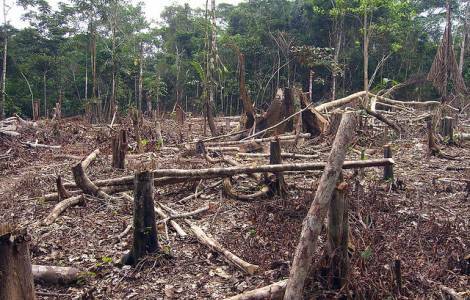 Brazzaville (Agenzia Fides) - Forests disappear little by little due to the over-exploitation of timber and reforestation policy throughout the national territory", denounce the Bishops of the Republic of Congo (Congo Brazzaville) in their Christmas message for the new year. "Ours is a Country blessed by God", the Bishops said in the message sent to Agenzia Fides, recalling the substantial forest, agricultural, mining and maritime resources in the Country. "But what do we do with all these good things?" In addition to the savage exploitation of the forest to extract timber, the message denounces the wild fires ignited "often by criminals" who "destroy entire forests" in the villages and the absence of a waste collection system and sewage disposal in cities which is why roads and rivers have become landfills. Lakes and rivers that provide water for drinking and bathing "have been transformed by some citizens in toilets and landfills with disastrous consequences for public health". "Malaria, which is the leading cause of death in our Country is also the consequence of the lack of maintenance of our shores and our public spaces, hence mosquitoes, flies and some microbes develop that cause these and other diseases such as typhoid fever", denounces the message.